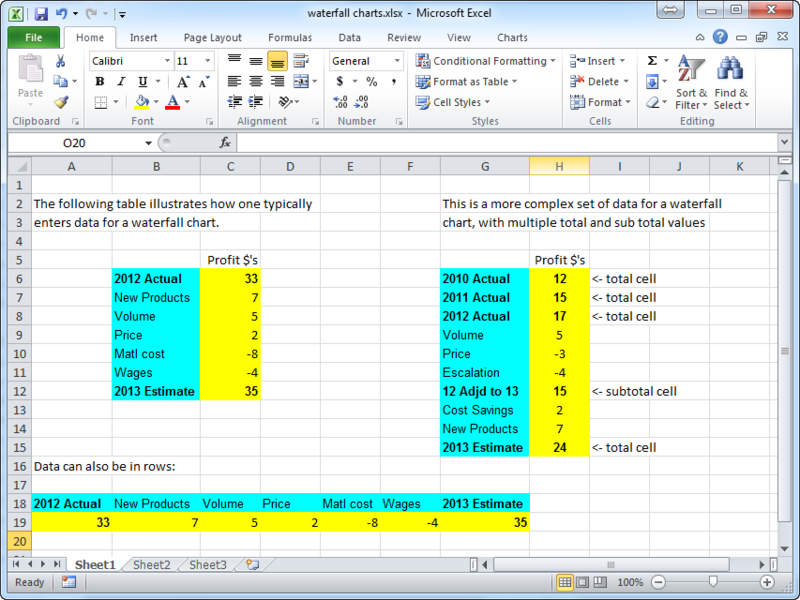 The Waterfall Chart Creator add-in for Microsoft Excel allows you to create waterfall charts. The Waterfall Chart Creator is totally menu driven. On a waterfall chart the height of the red and green boxes represents the amount of change due to an explanation which is listed below the box on the X axis. The value of the boxes can be shown in the middle, at the top, or at the bottom of the box. Such charts are an excellent way to explain change. More information on waterfall charts. With either approach you can plot as many data points as you want. And you can delete points if you don't need them. You can have multiple total values in a chart not just totals at the end points. And if you do not plot the totals you can create a brickyard style waterfall chart like the last example above. You may send waterfall charts you create with the Waterfall Chart Creator to others. They do not need the Waterfall Chart Creator add-in to view the charts. Connect totals and explanation blocks with horizontal lines between blocks, or lines that go value to value. Specify a Y axis minimum to eliminate charts with tall columns and small waterfall values. If you want to try a copy before purchasing, download a trial version now!